Kleefeld on Comics: On History: Whither Jungle Action? Years ago, I was collecting and collating historical information on the first 100-ish issues of the Fantastic Four. Creator interviews talking about that period, letters pages, scans of original art... whatever I could get my hands on. My idea was to write a book about the FF's creation, using as many as-close-to-first-hand sources as possible. I never got around to writing it -- I had trouble believing there was an audience for it -- but Mark Alexander eventually put together more or less the same thing. 70's Marvel appears to have been ripe with inter-personal politics. When Kirby came back, he only wanted to be left alone. He took his characters and pulled them away from the Marvel Universe. He wasn't interested in continuity. Remember that Kirby was the originator of T'Challa (there's evidence of a character named Coal Tiger in his files that shows that he had wanted to do this character for a while before it showed up in FF). When he came back to Marvel after going to DC in the early 70's, he didn't want to work on other people's characters. There was a deliberate attempt to keep these stories separate from what had been done before with the characters -- to go back to the original concepts of the characters as envisioned by Jack. He wanted Captain America back, as his claim to that character dated pre-Marvel, and the only other character he'd co-created who was considered available was the Black Panther. Now, your question is WHY was Black Panther considered available? Remember that we are remembering Jungle Action from the benefit of hindsight. JA was popular with a certain level of reader, but was never a popular hit. The vast majority of comic buyers at this point in time were still young boys, not older fans of the medium. JA never rose above bi-monthly status, which indicates that its sales were solid enough to avoid cancellation, but not enough to raise it to monthly status. This is true of most of the more "adult" Marvel books of the 70's: Warlock, Captain Marvel, Dr. Strange, Killraven, etc. Kirby was pure action and perfect for that target audience. There should be circulation figures in issues of JA and BP that would allow one to compare the relative popularity of the two runs. I would guess that the Kirby version probably sold a little better, but to an entirely different audience than JA. (unfortunately neither audience was big enough -- maybe if they could have been combined somehow). As I recall, and I'm sure people on this list, including Don, can attest, Don's books, even though most were bimonthly, were often late on deadlines. Marvel was very sensitive about this issue, to the point that when Jim Shooter took over, he instituted several policies guaranteeing "fill-in" issues be ready at a moment's notice. If JA was one of those chronically late books, taking it away and giving it to Jack, who never missed a deadline, could be seen as a good business decision. Not an artistic decision, but a business decision. In addition, comic distributors were always very cautious about offending people in the rural midwest and South. There are anecdotes galore about how publishers wouldn't even allow black characters or heroes because it would offend major distributors. In a newstand distribution model, if you don't get distributed, you don't even have a chance to sell your product. The story against the Klan could very well have been creating some of these negative reactions. Newstand distributors in the 70's were an odd bunch. Again, there are many different stories, but if they decided to kill a book, they could. They could simply refuse to put the book out, and automatically claim a return against the "unsold" copies. There's some strong anecdotal evidence that many "hot" books of the 70's like Green Lantern/Green Arrow and Kirby's Fourth World books were being sold in case lots out the back door and then those copies claimed as unsold because they were never counted as having been distributed through "normal" channels. The Klan story could very well have given these distributors a reason to stop pushing a marginal title, whether there was any actual public outcry or not. And that is important, I think. JA was a marginal book. It's artistic impact may have been strong, and as you indicate in your email it's impact in the black community was disproportionate, but overall, the Panther was not a mainline character. He was published to a small but loyal audience. The publisher made a business decision to try a new approach to try to reach a larger, more profitable audience. I don't think that there was any conspiracy or even any racial overtones to the decision. After all, Marvel has consistently tried to revive the Panther, so there's clearly some appeal to the character in the editorial offices. 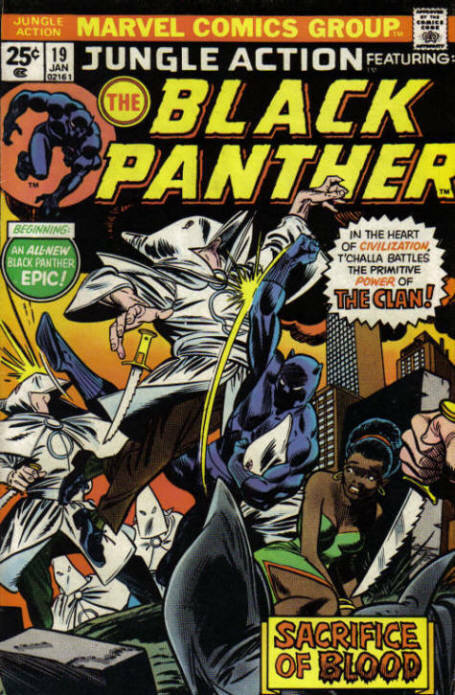 They finally concluded the Klan storyline in Marvel Premiere late in the 70's, the Panther was a long-running part of their bi-weekly Marvel Comics Presents title, there was the 4 part bookshelf series, and the revived series written by Christopher Priest. There probably was a personality conflict that caused JA to be cancelled and given to Kirby, but it was also justifiable as a business decision. Ironically, Kirby's treatment in his second tenure at Marvel was a horror show, partially because people resented books like JA being cancelled and the Panther given to him.